Here at The Marijuana Times, we’ve covered numerous stories of patients successfully treating their diseases with cannabis medicine. As touching as those stories are, none of them compare to the amazing work that the cannabis professionals at CannaKids and SavingSophie.org are doing. When CEO Tracy Ryan’s daughter, Sophie, was diagnosed with a rare optic pathway glioma brain tumor at 8 1/2 months old, she knew there had to be a better way for her daughter to get treatment. After hundreds of hours of research, Ryan and her team now provide these resources and information to families in the hopes that they can avoid the heartbreak, frustration and confusion that she and her husband initially went through. “With over 500 patients treated in the last year and a half, my team and I have no doubt what this incredible plant is capable of. After seeing patients survive when they were otherwise not supposed to, and also being privy to scientific research being done by some of the best researchers in the world, it would be impossible for me to question the efficacy of this medicine,” said Ryan. CannaKids is a California based collective who supplies Honey Gold cannabis oil to children and adults who are suffering from cancer, autism, epilepsy, PTSD, Crohn’s disease, severe pain disorders, and more. 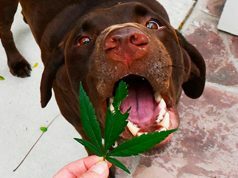 “The public response we have gotten towards CannaKids and SavingSophie.org has been very positive. Once people are educated on the science behind the plant and how it works with our endocannabinoid systems, they are happy give it a try. Some of our patients take just the cannabis oil alone, and others use it alongside chemotherapy. 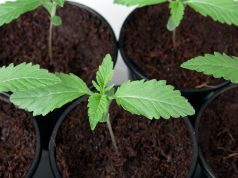 Cannabis does a lot to alleviate the symptoms of chemo like nausea, helps with loss of appetite, and in many cases can help shrink the patient’s cancer,” said Dara Minchew, Director of Marketing for CannaKids and SavingSophie.org. SavingSophie.org is a 501(c)(3) non-profit organization with a focus on providing resources and financial support to families whose loved ones are stricken with cancer and other serious diseases. Every member of the team believes in the healing abilities of cannabis medicine and they’ve all been impacted by cancer in some way. “At SavingSophie.org our focus up until this point has been mainly helping families whose loved ones are suffering from all forms of cancer, pediatric and adult. As we continue to grow, we aim to add more resources and education to help those who suffer from epilepsy, autism, Crohn’s disease, and other ailments. Our goal is to provide much-needed assistance to as many of these families as possible,” Minchew said. 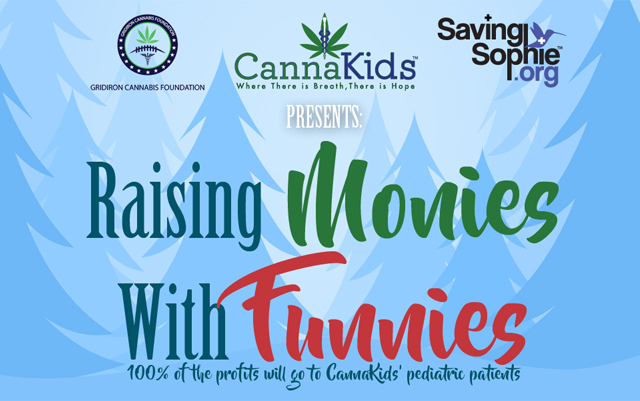 On top of the invaluable work they are already doing, CannaKids, Saving Sophie and the Gridiron Cannabis Foundation are now presenting the 2nd Annual Raising Monies with Funnies Holiday Toy Drive & Silent Auction. Actress and comedian Camilla Cleese will return again to host this remarkable event. 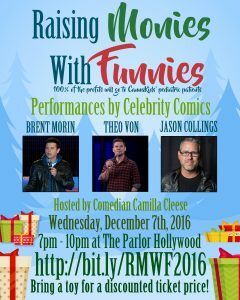 Providing the evening’s entertainment will be comedians Brent Morin, star of NBC’s Undateable, Jason Collings, a regular headliner at The Improv and Comedy Store who has also appeared on The Tonight Show, and Theo Von who can be seen in his own Netflix comedy special titled No Offense. Event attendees will receive appetizers and gift bags. There will also be raffle prizes and an ugly sweater contest. 100% of the proceeds from the event will go to families who have a child with cancer, epilepsy, autism, and other serious pediatric diseases. Their goal is to raise as much money as possible to help affected families with the financial burdens they may face, and provide toys to ensure these kids have the Christmas they deserve. “At last year’s event, we raised close to $13,000. We’d love to see that number doubled or even tripled. With this money we were able to provide free medicine to 12 pediatric patients and their families who may not have otherwise been able to afford it. Unfortunately, health insurance doesn’t cover medicinal cannabis. It’s heart-warming and inspiring to be able to alleviate some of the financial burden these families face, especially during the holiday season,” Minchew said. 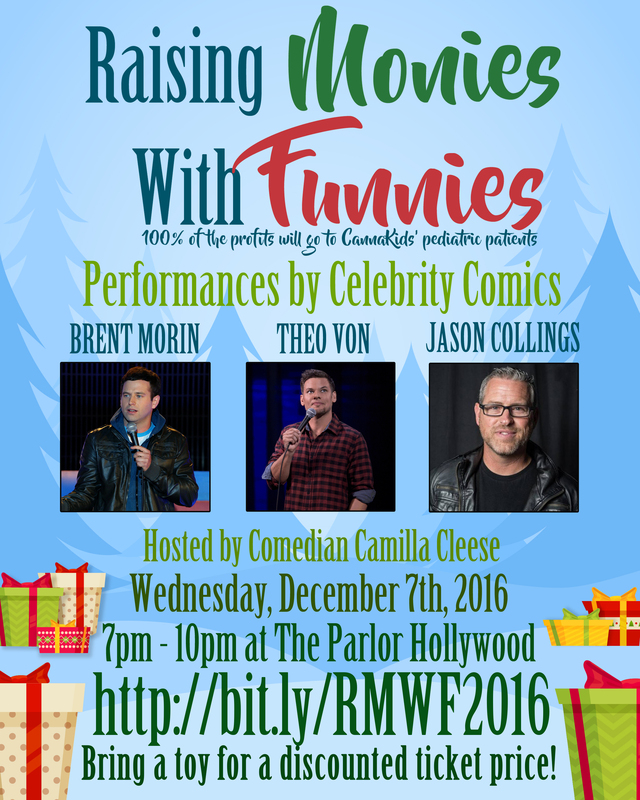 The event will be held on December 7th, 2016, from 7pm-10pm at The Parlor in Hollywood. 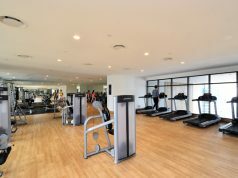 Guests are encouraged to bring a children’s toy to receive a discount on their ticket price. Pre-order tickets for the event are available here.